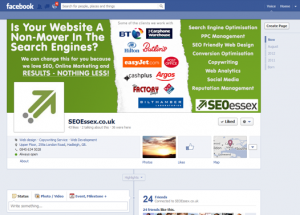 Here at SEO Essex, we recommend the use of a Facebook business pages to promote your business. With nearly one billion active Facebook users, not having a Facebook business page could mean losing out on a significant level of business. The value of having your own Facebook business page is especially significant in this fast paced market. Despite this, many businesses are yet to sign up. This may be due to the common confusion of understanding the difference between setting up a personal Facebook page and a commercial Facebook page. For those who are puzzled by this, don’t be embarrassed as this is a common query that we have encountered over the years. In response to this, the two Facebook platforms are in fact entirely different, which is why it is certainly beneficial to set up both a personal and commercial page. Whether you have a business Facebook page set up already, or whether you plan to set one up one in the near future, we have a list of Do’s and Don’ts to get you up and running. There is like nothing better than a crisp image to spruce up a site. It is important to consider that your Facebook business page is helping to sell your business, just as your main web site is and for that reason. It is essential that you sell your site effectively and efficiently – it is vital for your branding that you do so. When considering your imagery, checking the dimensions is a must, as distorted imagery and incorrect pixel sizes look unprofessional and cheapen the look of your business! If you didn’t know already, Facebook has specific cover image requirements set out which can be referred to in their full Facebook Pages Terms and Guidelines. The cover image that you choose is supposed to enforce your brand whilst providing an opportunity for you to connect with your target audience. We would advise that you include your company tagline below your cover image. On the other hand, it is not meant as an opportunity to ‘hard-sell’ or for the use of self-promotion. We suggest that you use a branded image of the correct pixel size, whilst steering clear of direct selling references. These include; ‘sale now on’, discount call to actions or featuring prices in general. Also, think about the different sections you have to cover, for example some of the information you include, may be better suited to the ‘About Us’ section. Finally, it is vital that you ensure you have legal copyright for all of the images that you choose to include. We suggest that you customise your applications, whilst also being fairly selective about the four applications on display underneath your Facebook cover image. We would also suggest that you try to customise each of the applications that are available on your timeline – there are 14 in total! If you can do this, it is also worth creating a unique thumbnail for each app as well as a unique URL in order to drive traffic to that specific application. It is imperative that you think about your target audience and create relevant posts that vary in topic so that you are not boring your fans to tears. Even more importantly, please ensure that your posts could not be deemed in any way offensive – you do not want to be upsetting your fans. It is essential that you remain consistent with your posts. In other words, don’t just post as and when you feel like it, instead be sure to set a certain day or the week or month to publish your posts. If you choose to post on a daily basis, try to aim to do so around the same time of each day. It is important that you remain consistent in regards to your posts as this is required in order to develop an effective relationship with your user base. What’s more, the posts that you add need to be of a high quality. Remember that variety is the spice of life, so whilst remaining consistent with the times in which you post, it is important to vary your content. Your business fans do not want to be inundated with the same old information, so it is worth brainstorming some fresh and exciting ideas in advance of the posting date. If you are to take just one piece of information away from this blog post, make sure it is this; social media is constantly developing and always on the move, which is why it is vital that you consider this in every media move that you make! Do not sit still – keep ahead of the game and ensure that your strategy is vivacious to lure in a forever increasing level of custom. Do You Want Professional Facebook Business Page Design? Contact us today and let us know what your requirements are. We have a range of different Facebook pages for businesses that we have worked on – and the next stage after designing it, it running successful Facebook advertising campaigns of which we have a wealth of experience with generating great results. When you speak to us, ask us to show you some examples so you can see for yourself.